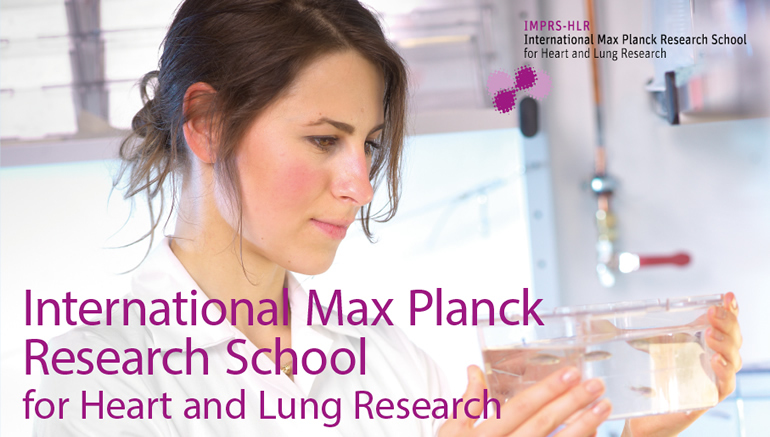 The International Max Planck Research School for Heart and Lung Research (IMPRS-HLR) offers up to ten positions to talented and enthusiastic students holding a relevant Master‘s degree. Being the leading educational platform of the renowned Max Planck Institute for Heart and Lung Research (Bad Nauheim, Germany), the PhD program brings together experts from all over the world and is operated together with the Goethe University (Frankfurt) and the Justus Liebig University (Giessen). We are inviting outstanding students to apply as PhD candidates! Our application system is open every year from November until end of January. Doctoral fellows will participate in a three-year professional graduate school program including dedicated seminars, methods courses and retreats and will benefit from the scientific offerings of the Max Planck Institute and affiliated universities and hospitals. The international and multi-disciplinary approach of the program promotes cross-frontier thinking and scientific networking. An individual thesis advisory committee will provide personal feedback, guidance and mentorship for every student and to pursue their research projects, doctoral students are supplied with competitive funding. Applicants should hold an MSc with a strong background in biological sciences, biochemistry, medicine, pharmacy or a related discipline. For more information and to apply, please visit us on https://imprs.mpi-hlr.de/.